Recycle Kyle is from Seattle and loves to skateboard. He was skateboarding and fell down on a can – oops. But since then, he has been dedicated to recycling after seeing how easy it is and that everyone can do their part. 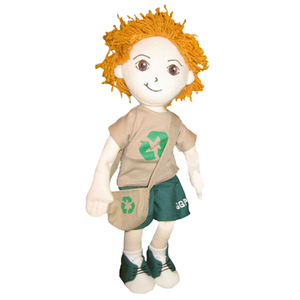 Kyle is the perfect best friend and companion for your special little boy or girl and is a great imaginative gift for everyone who cares about the planet. Kyle comes fully accessorized wearing a removable t-shirt with a recycling symbol, shorts, coordinated sneakers and a Kyle-sized recycling bag.